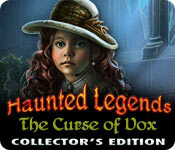 Haunted Legends: The Curse of Vox Collector's Edition is rated 4.0 out of 5 by 78. Rated 5 out of 5 by KeysPirate from Love the graphics! Big & bright. I'm buying CE. Just completed the SE demo and was having so much fun that I'm going to buy the CE. My vision is not great so it is very important to me for a game to have large, clear graphics and text. The "black box tips" are witty and don't give away too much. I like the animations, including the funny little guy who appears sometimes when you enter a new scene. You have to pay attention or you might miss something. It is okay with me that the characters and scenery are cartoonish. FUN! 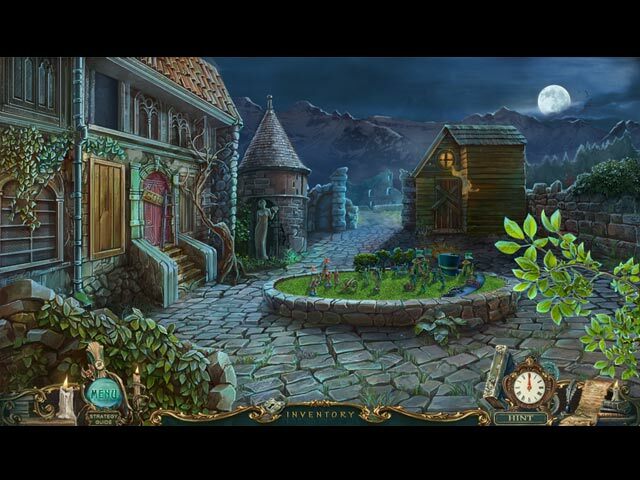 Rated 5 out of 5 by rosekaufmann from LOVE THAT GNOME and POLTERGEISTS Fun game with lots to do as you try to put things right on your friend's estate. She doesn't really like people coming from the otherworld to visit her. And she doesn't need the gnome to bother her or her estate. The poltergeists are great fun. Graphics are a bit hazy, but since this is an ERS game, I assume that this was intentional. The voice overs are exceptional. And I love the evil gnome - can never wait to see what he plans on doing next. You have a journal with your collections and and interactive map. Very good production values with a lot of attention to detail, not to mention an interesting story. And the gnome - still love the gnome. The only thing to do is determine if you want the CE or SE, although the CE has a lot to offer to sway you. Did I mention the gnome? Rated 5 out of 5 by Jem_Jerrica_Guy from Story keeps getting better and better! There are more twists in this adventure than the previous. Still, it feels this story is going to come to its climax soon. Rated 5 out of 5 by Gyongy from Really fun to play I have always enjoyed the Haunted Legends games and this one is no exception to the rule. Beautifully designed, amusiong and fun. Look forward to the next one already. Rated 5 out of 5 by gooberteasdale from Gnomes, Flowers, and Fun! The previous games in this series were so well done, I was a little afraid of being disappointed with Vox. I needn't have worried! The devs have outdone themselves. I have no negative comments at all. The entire experience was a delight. It took me a little while to figure out the Garden, but like Nilosh said, it was a charming diversion. (Welcome back, Nilosh!) The length was perfect, the music unobtrusive, the mini games were moderately challenging, not too many HOS. I found the entire game had elegance and humour. The devs are masters at this genre. Buy the CE, it's absolutely worth it! Rated 5 out of 5 by cpezzop from Haunted Legions The Curse of the Vox I loved the little man with the big nose. It was a fun game. Rated 5 out of 5 by LADY_BLADE from Haunted Legends: The Curse of Vox Collector's Edition THE BEST ONE YET!!!! WOW..where do I begin with this most awesome game,,these “new generation” ERS games are ASTOUNDING. Each one comes up with a new way to INDIVIDUALISE the game and CAPTIVATE the gamer. In this one, COLLECTIBLES takes on a whole new meaning. Let’s start with the KNOWN. Our STORY centres around that DEVILISH DWARF from the previous games in this series, SG. He plays a much more involved part in this game, but it doesn’t really matter what he’s up to, we know it’s going to be NO GOOD. Somewhat surprisingly, he claims he is innocent of the murder we are investigating. Considering what we saw in the GRAPHICALLY BRILLIANT & SUSPENSEFUL intro, this is hard to imagine. It seems that at the heart of this mystery, is a magic book that grants wishes, VOX. And, clearly, SG is out to get it. At the moment it has an entire estate of GHOSTS caught in its clutches, and we will need to help them as well as find the answers to all our questions. The GRAPHICS are typical ERS, colourful, detailed, beautiful. The MUSIC is ABSOLUTELY EXCELLENT. Good on you, guys! The VOICES too are GREAT. The GAME PLAY. We have 2 types of HO SCENES, interactive LISTS and PROGRESSIVE SILHOUETTES (find this to get that, to do that, etc. ), visited twice each. 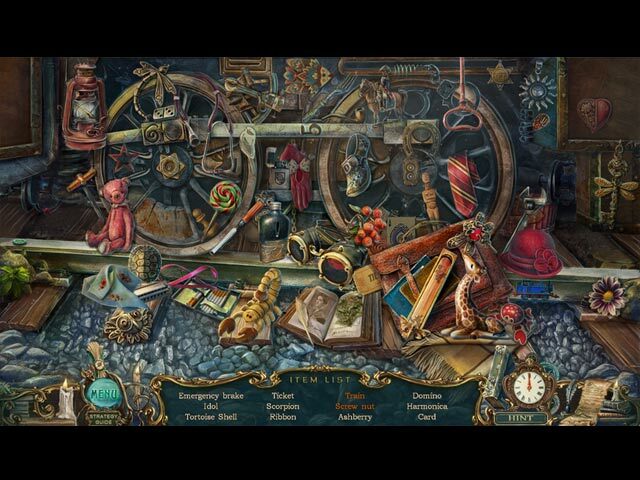 There are a few NOT EXCEPTIONALLY HARD PUZZLES, mostly simple, some involving more than one TYPE to clear the obstacle. Getting around and finding INVENTORY ITEMS is about AVERAGE level of difficulty, and reasonably logical within the CONTEXT of a magical game. HINT is DIRECTIONAL, there is a JOURNAL and a JUMP MAP (I don’t think it gives ACTIVE TASKS), so there's help if you need it. Then there are the COLLECTING SUB-GAMES. In order to HELP the GHOSTS and progress in the game you must first find POLTERGEIST SEALS which unlock bonuses such as INCREASED HINT RECHARGE SPEED, and help us with EVIL GHOSTS. Then, we must also find RINGS, to attach to a NECKLACE, which will eventually allow us to DISPEL the TRAPPED GHOSTS and beat VOX. We can also collect PLANTS for our GARDEN. This is an involved process. First, we must find the SPROUTS and a SPROUT EMBLEM. They can then be PLANTED, we must WATER THEM, and when they BLOOM, CUT them (more emblems need for this). With the CUT BLOOM we earn GOLD, kept in our TREASURE CHEST, with which we can BUY MORE exotic plants. Just where all this leads is STILL a MYSTERY, but it looks like fun. The list of CE EXTRAS is huge. GALLERY ITEMS (incl. SCREENSAVERS, and behind the scenes PHOTOS, MOVIES), SG, BONUS PLAY, REPLAYABLE HOS & PUZZLES, and your GARDEN. Such an amazing array of COMPLEX COLLECTIBLES is of itself worthy of a CE, but with everything else as well...I HIGHLY RECOMMEND THIS GAME..PAY NO ATTENTION TO THE NEGATIVE REVIEWS..I MAY EVEN PLAY THIS ONE AGAIN!!! 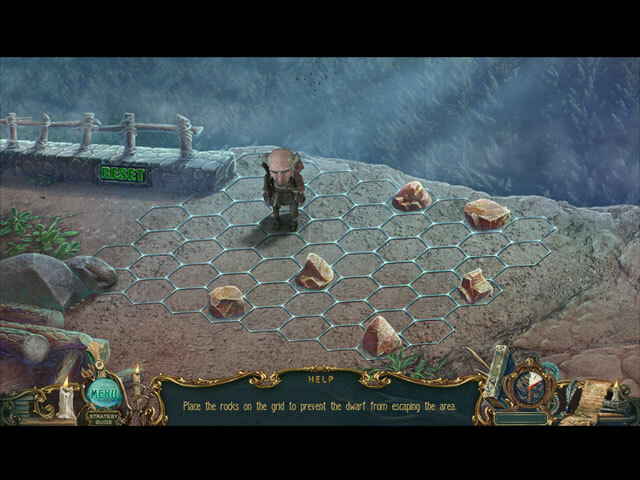 Rated 5 out of 5 by jumisa from Haunted Legends Curse of the Vox I really liked this one...the graphics were very nice, I liked the fact that there wasn't a HOS and a puzzle in every single scene like some of them have. That bothers me a lot, it's interference, but this one had the right amount of both and I enjoyed it.